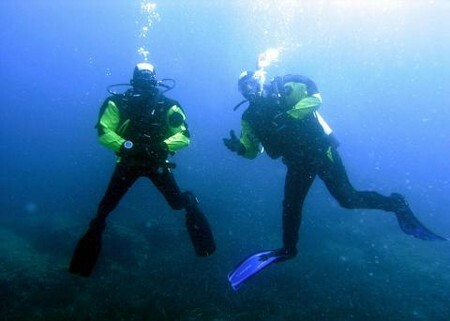 Drysuits are used in temperate climates where the water may not be very warm. The core function of a drysuit is to keep you dry. To do this, it must fit you well, have efficient seals at the neck and wrists, and be made of a material that does not allow water to pass through it. The material must also be hard wearing because if it gets punctured even with the minutest hole, at the pressure encountered at depth, water will gush in. A drysuit gets compressed as you go deeper, so a method of inflating the suit with air to keep its volume constant is needed. Drysuits have a direct-feed inflation valve, which is fed with air from a hose connected to a supply of gas, normally the main air supply of the diver. In this way, buoyancy can usually be controlled without resorting to use of the buoyancy compensator (BC). The reduction of pressure during an ascent causes the air in the suit to expand. This air needs to be vented, and a drysuit has a dump valve for this purpose. Cuff dumps are operated manually, while auto dumps, more properly called constant-volume dumps, vent air automatically. The position of a dump valve is critical and should be at the highest point that air can rise to in the suit, which is normally the upper shoulder. Drysuits are made of a variety of materials, including thick neoprene, crushed neoprene, compressed neoprene and laminated layers of butyl rubber or another rubberised material. Trilaminate suits and other membrane-type suits do not get compressed at depth so are easier to maintain constant buoyancy. Thick neoprene suits often need to be used in conjunction with air in the BC. Seals can be made either of latex rubber or thicker neoprene. The former tends to be more watertight but is also more fragile. The latter tends to be more comfortable but a little damp. To make a drysuit less bulky, manufacturers have come up with several design features, such as telescopic bodies worn with a tuck and elasticated or ruched waists. Internal suspenders can make them more comfortable. A diver gets into a drysuit through an opening that is closed with a watertight zipper. This can be positioned either across the shoulders or diagonally across the chest. Front-entry, self-donning suits are rarely that easy to put on, and divers always seem to need the help of a buddy to close the zipper that last few centimetres. Drysuits usually have integrated boots or closed sockends for use with separate hiking­ style boots. A wet hood can be worn. Fit is very important, and if you are not a standard size, you will need a made-to-measure suit. They may keep the diver dry, but drysuits do little to keep a diver warm in the water. Thermal insulation is provided by an undersuit that pulls away sweat on the inner surface and uses modern fibres to insulate the diver from the cold.